221 Jan. 1945. Feb. 1945. 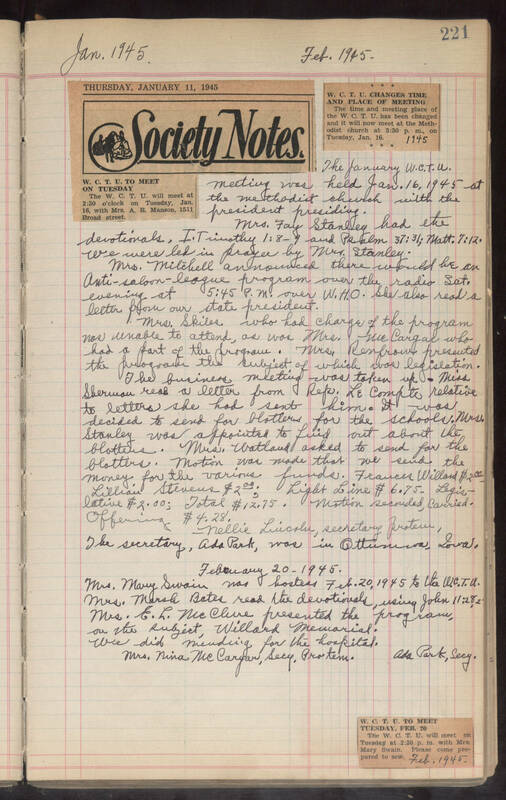 THURSDAY, JANUARY 11, 1945 Society Notes. W. C. T. U. TO MEET ON TUESDAY The W. C. T. U. will meet at 2:30 o'clock on Tuesday, Jan. 16, with Mrs. A. B. Manson, 1511 Broad street. * * W. C. T. U. CHANGES TIME AND PLACE OF MEETING The time and meeting place of the W. C. T. U. has been changed and it will now meet at the Methodist church at 3:30 p. m., on Tuesday, Jan. 16. * * 1945 The January W.C.T.U. meeting was held Jan. 16, 1945 at the methodist church with the president presiding. Mrs. Fay Stanley had the devotionals, I. Timothy 1:8-9 and Psalm 37:31; Matt. 7:12. We were led in prayer by Mrs. Stanley. Mrs. Mitchell announced there would be an Anti-saloon-league program over the radio Sat. evening at 5:45 P.M. over W.H.O. She also read a letter from our state president. Mrs. Skiles who had charge of the program was unable to attend, as was Mrs. McCargar who had a part of the program. Mrs. Renfrow presented the program the subject of which was legislation. The business meeting was taken up. Miss Sherman read a letter from Rep. Le Compte relative to letters she had sent him. It was decided to send for blotters for the schools. Mrs. Stanley was appointed to find out about the blotters. Mrs. Watland asked to send for the blotters. Motion was made that we send the money for the various funds. Frances Willard $2.00. Lillian Stevens $2.00; Light Line $6.75. Legislative $2.00; Total $12.75. Motion seconded, carried. Offering $4.28. —Nellie Lincoln, secretary protem, The secretary, Ada Park, was in Ottumwa, Iowa. February 20 - 1945. Mrs. Mary Swain was hostess Feb. 20, 1945 to the W.C.T.U. Mrs. Marsh Bates read the devotionals, using John 11:28, 2 Mrs. E. L. McClure presented the program, on the subject, Willard Memorial. We did mending for the hospital. Mrs. Nina McCargar, Secy. Pro tem. Ada Park, Secy. W. C. T. U. TO MEET TUESDAY, FEB. 20 The W. C. T. U. will meet on Tuesday at 2:30 p. m. with Mrs. Mary Swain. Please come prepared to sew. Feb. 1945.